How Can We Serve You? A series of tests are conducted in a comfortable and state of the art environment. We strongly encourage you to bring a family member or friend to your initial appointment because testing works best when we use a familiar voice. We will explain the results in a way that is easy to understand and answer any of your questions. Once you and your Audiologist develop your personalized hearing solution, the hearing aids will be customized to fit your hearing loss. Different features on your hearing aid will allow a tailored approach to address your lifestyle. We offer a no-risk, 60-day trial period. Our on-site lab allows us to optimize the function and life of your hearing aids where we are able to clean and sanitize the hearing aids, remove wax or debris, replace battery doors and change ear hooks and tubing. In addition, we are able to make minor repairs while you wait or if more extensive repair is necessary we can handle the repair order with the manufacturer and set you up with a loaner hearing aid customized with your hearing prescription. Because we carry all major manufacturers’ products we have all the current tools and software to make adjustments to your hearing aids. 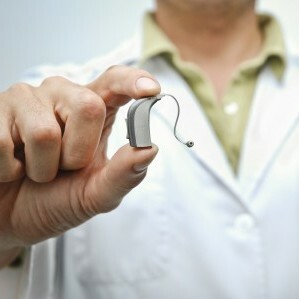 We also offer FREE adjustments for the life of your hearing aids. At Woodard Hearing Centers, we believe that it’s important for you to fully understand your hearing loss, the effects of hearing loss on your life and on those around you, amplification that is available and strategies for regaining your hearing. We’re committed to educating and guiding you through the journey to better hearing. For businesses and organizations who provide hearing tests to their employees, Woodard Hearing Centers has Certified Hearing Conservationists to conduct on-site hearing tests and the necessary reports so your company can be in compliance with OSHA standards.